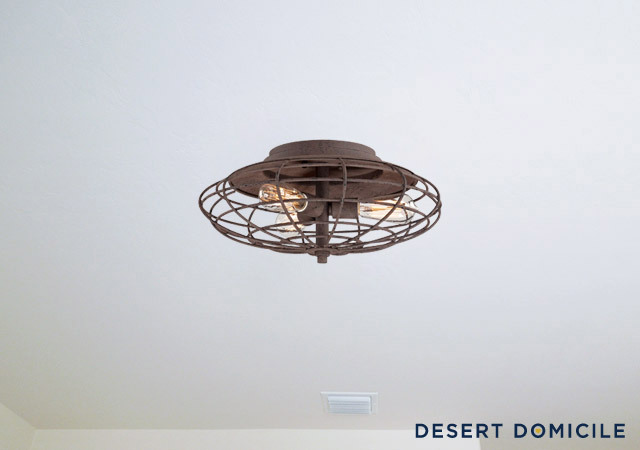 We're getting closer and closer to putting the finishing touches on our office and are in the market for a new light fixture. I like the geometric shapes and how the patterned outer sleeve (?) sticks out away from the glass shade. It takes 3 light bulbs so it should give off enough light and I imagine it'd cast some fun shadows on the walls! I like how the squares of the light's sleeve pick up on the squares in the Vittsjo shelving units and how the oil-rubbed bronze finish ties in with the black and white art we have in the room. It's almost perfect but its $271 price tag is more than I'd like to spend. To me, Hampton Bay's Edgemoor light is like the poor man's Parker light – and there's nothing wrong with that! 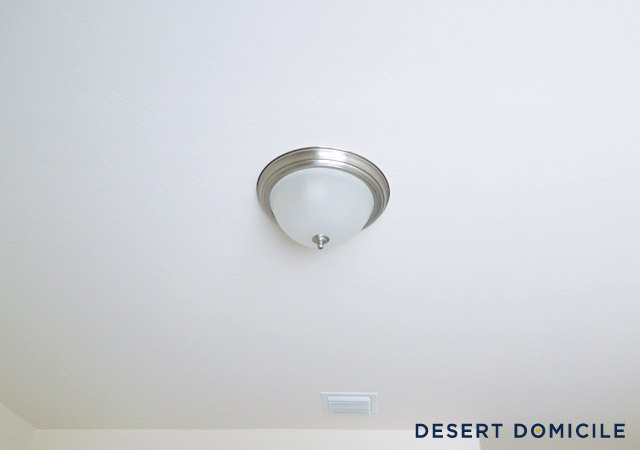 It's a semi-flush mount light which means it'll drop down a little from the ceiling but that could be a good thing considering light would shine up towards the ceiling and reflect back down into the room making it brighter. 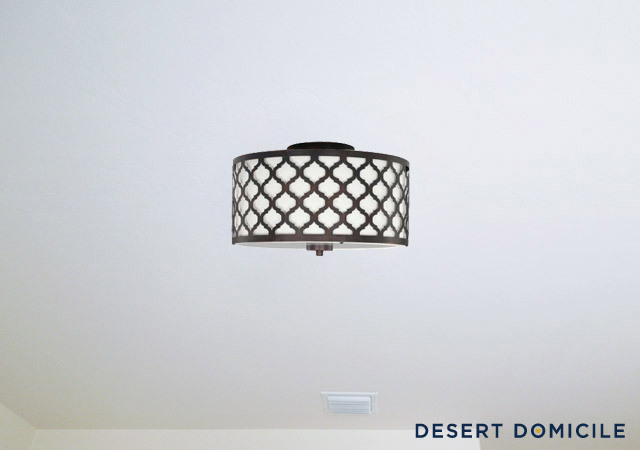 I like the moroccan trellis pattern more than the square pattern above and the $90 price is much better as well! The only con is that it's a little small at 13 1/4". I love the rusted finish and how open the cage of the light is but do you think the open cage is competing too much with the openess of the Vittsjo shelves? They'll be filled with accessories which will make them look less open so it might not be too bad! 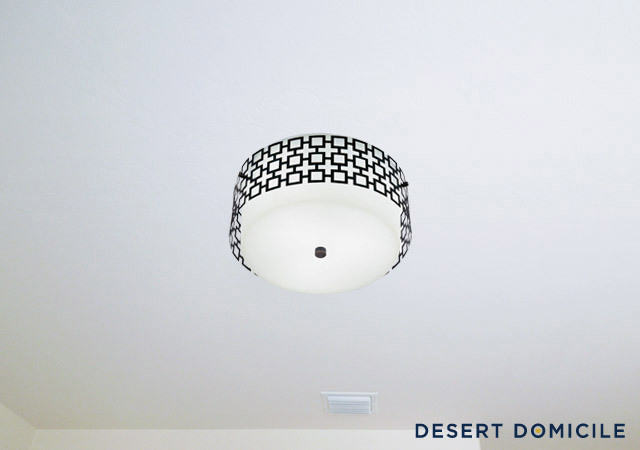 This was one of the first lights I was eyeing early on in my search but I initially ruled it out because I thought it was a fluorescent light. As it turns out, I read the description too fast! I went back and searched for it again last night just to double check things and as it turns out, it's a CFL light! Granted a CFL light is still technically a fluorescent light but I don't think CFL bulbs are as bad as full on fluorescent ones are. This is another semi-flush mount light that will hang down about a foot. 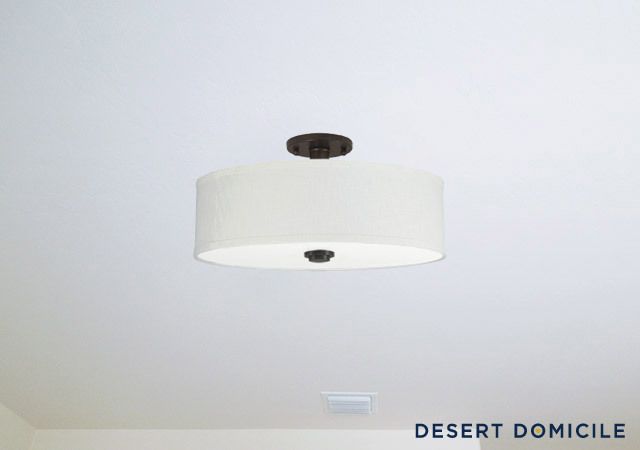 We have 9' ceilings though so I think the room can handle the fixture without the room feeling like it shrunk too much. What do you think? Which light would you choose? Have another option you think I should consider? Link to it in the comments! Nice selection! Personally, my top two would be #1...the Jonathan Adler Parker (#1), and #2 Lowe's Valencia drk broze fab (#4). I want to like the industrial cage (#3) because I just LOVE LOVE LOVE the industrial stuff....VERY COOL. But seeing it with the other things in the room.....not so much! :( . You know me, for me it's Jonathan Adler but in your case I think I'd have to say #3. It's so you! I love the Jonathan Adler light, but the Edgemoor is a much better deal. I do like how clean the Valencia looks too. kind of similar to your #s 1 and 2, esp. #2. It's more expensive ($123), but it's HUGE--19 inches, 3 bulbs. Anyway, we really like it! I like all of your picks except the industrial one...I mean, I LOVE the industrial one, but not in your office, I don't think. 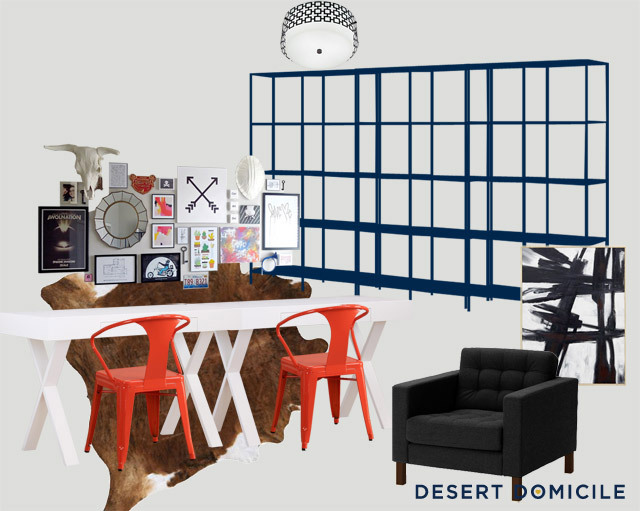 It's totally not my style, but I think #3 would look awesome in that room!